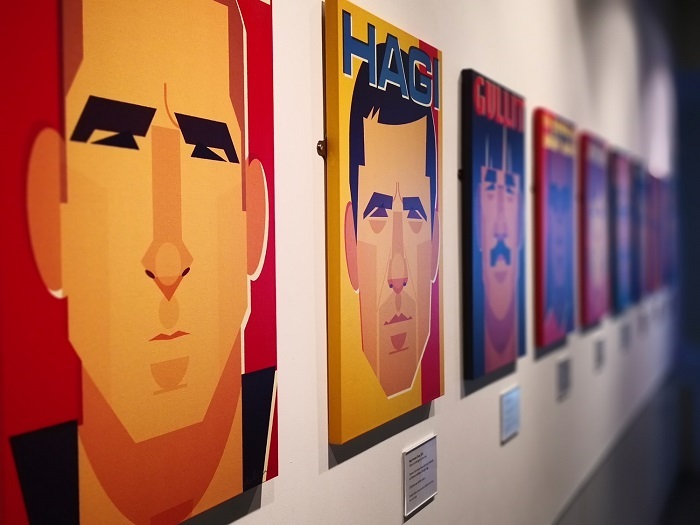 Renowned Manchester artist and illustrator Stanley Chow will showcase new work in an exhibition celebrating the football moments and players that have inspired and influenced him. Stanley has found worldwide acclaim for his portraits of stars from sport, music, television and film. His work has featured on book covers, in numerous magazines and newspapers such as the New York Times and New Yorker and many global advertising campaigns. The Museum set Chow the task of selecting his all-time favourite football XI, for which he has produced a set of exclusive illustrations featuring some surprising inclusions. The exhibition will also include objects from Chow’s personal collection and the Museum’s archive, including a football sticker album which he collected as a child in the 1980s. One of Chow's earliest football memories was watching England play France in the 1982 World Cup on television while waiting with his family to catch a flight to Hong Kong. Bryan Robson scored after just 27 seconds; his England shirt from the game will be displayed here for the first time. The original signed artworks will be available to purchase exclusively from the National Football Museum during the duration of the exhibition, with limited edition prints also available from our shop.